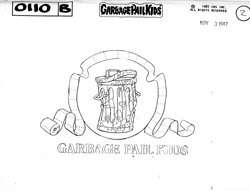 Way back in the day that Saturday Morning Cartoons ruled the television (1987), the crew behind Garbage Pail Kids wanted in on the action. And wouldn't you know it? 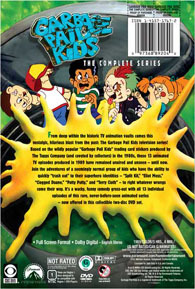 - a show actually was green-lit! 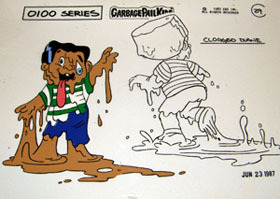 Sadly, due to complaints about some 'controversial themes', the GARBAGE PAIL KIDS CARTOON never aired. But alas, on April 4, 2006…the entire 13 episode Season 1 was released on DVD…and everyone could watch what they'd been missing all these years! 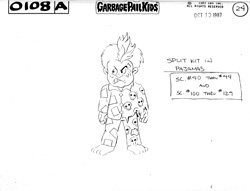 Given the fact the show was cancelled so close to it's launch, all of the work had been completed including (but not limited to) scripts, designs, animation cels, characters, etc. 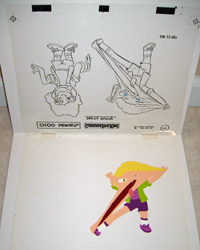 The production cels feature two different 'layers'. The top layer consist of a sheet of Acetate. The artist will draw the black outline of the character on the Acetate. The bottom layer is actually a sheet of cardboard. The artist will use this layer to apply paint, details, etc. This way, when both layers are laid upon each other, it appears as if the color and outline are as one. 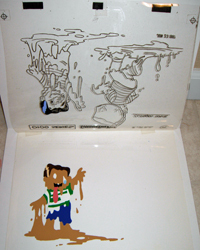 I have photographed my cels in both layouts in an effort to illustrate the different layers. 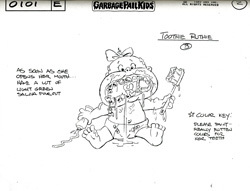 CBS created a manual for the cartoon that was comprised of concept sketches for every character in the series. It consisted of multiple drawings of each character, showing them in different environments or with different expressions. 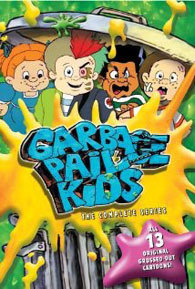 Not only did it include drawings of the Garbage Pail Kids who were to be featured in the cartoon, but it featured numerous other characters that were intended to be in the cartoon as well. 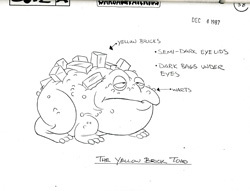 From parents, to Giant Thumb Armies, to Yellow Brick Toad - they were all in there. The manual itself is 150 pages and while not an original, it is believed to be one of the only copies in existence. Below, I have scanned in a couple of the sheets to give an idea of how the book was laid out. Each page not only includes a drawing of at least one character, but also includes notes related to the drawing. Interestingly enough, the last few pages of the manual consist of caricatures of the artists as well as the CBS Employee Drug Policy! Truly a rare item indeed. How much do I love the Internet? Let me count the ways!! Towards the top of that list is the fact you can WATCH EVERY EPISODE OF THE CARTOON right here on GEEPEEKAY! That's right…Episode 1 is right below, and Episode 2 will start streaming immediately after it finishes, or you can visit MY GPK CARTOON YOUTUBE PLAYLIST to pick a particular episode! Now, on with the show!